Because this is highly testimonial, and reflective many years after the fact, it will have somewhat of a character of "memoirs." However, the core of these notes was originally written in 1995, 10 years after I began an adventure among the Maasai people in the vicinity of Mount Suswa, in the Great Rift Valley of Kenya. The notes arose out of a request for some background and report of the status of churches I was involved with starting in a period of a little over three years from 1985-1988. Additional notes were added in 2010. My later reflections, evaluating the situation and later developments after my initial stage of the work, may also give it a "didactic" flavor. I hope that will be informative of the situation and the dynamic of what was happening. Over the 25 years I worked in various capacities with the Baptist Mission of Kenya, and the regional level covering 27 countries of Africa, this situation in Suswa is the only place I actually started brand new church work. My primary work was not in new church starts. Though I was involved, as were all in our mission, in local church work, preaching and teaching, my primary assignmetns were in more specialist areas, like radio-TV production and then language and culture training for new foreign workers. I had been involved in various ways before and after, in more established work, or with young churches started by others in a more established area of Kenya. 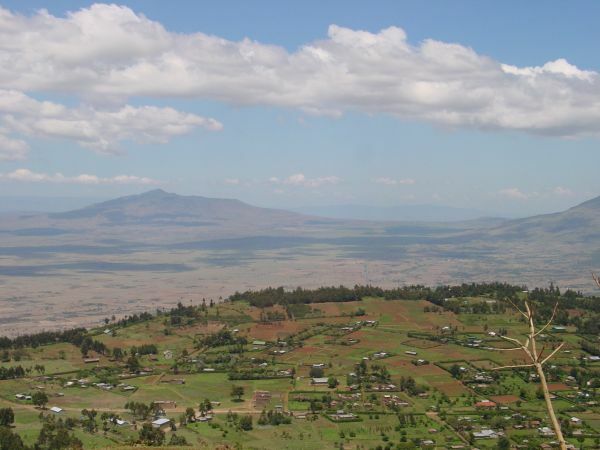 I worked in the Suswa-Longonot area of the Great Rift Valley in Kenya. This is the Suswa District of Rift Valley Province. Suswa and Longonot are small mountains in the Rift Valley near the main east-west highway across Kenya about an hour's drive outside Nairobi. My main contact area there was the village of Oloirowua. From there we connected through the natural social and lineage network to the hills and plains around there. We had groups (churches) meeting in the towns of Naivasha and Nairage-Engare in Suswa District and there was at least one other group in the next district town of Narok, district administrative center of Narok District. This was the sub-tribe of Keekonyokie Maasai. There are about 10 (some say 9) sub-groups of the Maasai, who have somewhat different characteristics and language differences. They differ in the kinds of colours and patterns in their beads and dress. Beginning in 1985, this was totally new work, in terms of churches. Various levels of contact had been going on in the area from 1971 or so, when I myself was going out there with a mission doctor just once a month initially. I began making regular contact in mid-1985, after some new missionaries visiting as they traveled through were told by some people there they wanted to "start a church." Of course, they did not know what that meant, but they associated "church" with school, or wells, or other "modern" opportunities. In earlier times, the Maasai had been indifferent or opposed to such change. But matters had changed rapidly in the late 70s and 80s due to extended droughts and the resulting worsening of land conditions, increased population all over Kenya, and the government's new plan to settle families into family villages called Group Ranches. In the first year I worked with Oloirowua and neighbouring villages (in about a 10 mile radius), they planted their first maize (corn) crop. 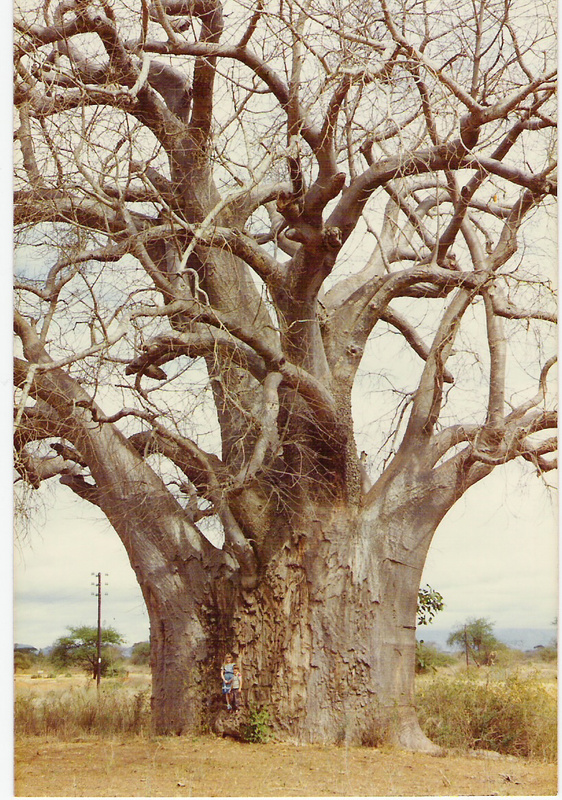 The Baobab tree is an icon of the African plain and semi-arid areas of East Africa. Legend has different reasons why this tree has its roots in the air! After ten years, only one of the churches we started had died. This was Enariboo, where the two new missionary trainees in their initial language-culture training put up a building before we had a church. These two recent arrivals went over and got that building where a church had disbanded, and put it up for the people of Enariboo. It actually became a school and Christian services were held there on Sundays. Worship continued here for a while, and we had baptism there in April 1986, after the baptism at Oloirowua. The local leaders wanted to have a school in that building, and we agreed. My partner Herb Cady told me it finally died out after I had left the work in his care. The Enariboo work lasted maybe three to ofur years. At Oloirowua, we started meeting under the public tree and continued that way until they built their building after a couple of years. Oloirowua is the leading church in the area. By 1995, they were large, almost one hundred, and served several surrounding villages. By 1995, there were about 25 churches in the association, and about 450, maybe 500 members. Not as big as I would have thought. The last time I had any news from Suswa, all the churches that Herb or I started were still there except Enariboo. The others were started by members from one of the original churches going to a neighbouring village. They all originally met outside or in a school building. There were two town churches in Nairage Engare, which were Luhya, made up of Luhya workers in the area. These continued with fervor until the ethnic purges of 1988-89 (may be off a little on the year). These two churches died when the Luhya had to flee for their lives. Being Christian did not save them from this danger. Local leaders were those who arose in the church community. In some case they were women, usually they were men. Due to education and other advantages youth brings in the new world the Maasai find themselves in, several leaders were young men. This was unusual for the Maasai, but was accepted by the elders in the villages. We always made initial arrangements with the elders of the family villages (legally, they were group ranches), and worked with the sub-chiefs. But these were not assumed to be the church leaders. They supported us but let us work according to our own principles and practices. Leadership training was basic discipleship, because they were all new Christians. I taught them basic personal Bible knowledge and study skills. Most had basic literacy. But the Maasai, as most African peoples, were oral-relational in orientation and worldview. I took a relational approach in training and mentoring, also, not focused on information and knowledge, but on relationships and practical real-life faith on the biblical model. This was an oral approach, though I used printed materials to supplement where appropriate. In the Bible storying I used visual illustrations prepared for an African setting. Just about the time I started visiting Suswa, the Bible Society had published the first New Testament in the Maasai language. We established individuals as Readers in villages, to read the New Testament to the village. I followed my own format for Bible study, a basic discussion format, using question and answer after a reading of a portion. It was inductive, rather than analytical, not using topics, but learning from the stories in the New Testament. We were not cataloguing facts, in the western analytical manner. We were exploring the faith-life. I included comments and facilitated discussions on doctrinal and practical issues. Herb Cady helped on this, particularly from his Religious Education background on practical questions. Herb gradually took more of the discipleship responsibilities after he joined the work fulltime, then became the overall leader as I phased out of the work by the end of the third year. With a few leaders able to read, we used basic books of the Bible Way Correspondence School. A few individuals then entered into more advanced Theological Education by Extension materials. One young man entered a training program with the Baptist Theological College in Limuru. This was a non-residential seminar program designed to keep leaders in their cultural and ministry setting. The program provided certificate or degree training with two-week seminars on a quarterly basis. Some training was provided for evangelism teams through the Maasai Project, with others gaining practical experience through working with visiting teams in the Suswa area. During the three years I was there, getting the work going, most of the teaching and discipleship of Suswa leaders was informal, through the discussion of matters as we walked or rode from one place to the other, talked under the tree or consumed tea and wood smoke in the houses. Tea time is teaching time! For periodic formal sessions, we met in a school in one place, under trees in most places. We held our Bible training in the Africa Inland Mission (AIM) school down the road from Oloirowua. Incidentally, the only church in the area, the AIC church-school-clinic down the highway toward Nairage Engare, died out in the early 1900s, as our work continued to experience response and growth. The Baptists continued to maintain and extend a strong presence in the Suswa-Narok area. There are some other churches in Naivasha Town, a couple of small ones in Nairage Engare, and 2 meeting in the Suswa trading centre. These churches were largely Luhya people who had moved in (without their own buildings when I was last there). Baptists continued to expand over the years, but after my colleague Herb Cady left to work in the Northern Frontier with Samburu people, things changed. I heard from later contacts in the area that a young missionary who was assigned to work in that area began to change formats and approaches, to both training and relationship to the churches. From reports I received, it seemed the newcomer shifted to a more traditional missionary-oriented model, which evoked some concern from some of the leaders. His approach seemed to involve more control by the missionary on what was done and how it was done. This always hinders expansion, and the same happened in this case, according to reports I would get periodically through my contact network. A later study by a Church Growth specialist evaluating the character of the Maasai work reported that there was no exponential expansion, as we had experienced in the beginning. Churches were started by teams of paid or assisted workers or by a missionary. Though response continued to be strong, the rate of growth and the growth pattern was not like it had been when the churches were expanding through natural cultural network contacts, initiated and fostered by the Maasai themselves. It appeared that churches were organized more formally, perhaps more dependently, around the missionary, whereas I had orignally fostered a voluntary associational model common in Baptist polity. While Associations or similar church relationships and cooperation are common, and in fact what was called an association had been working in the early months of the Suswa work, it seems that it became a more institutionalized structure under later, more structure-oriented missionaries. It seems ironic that it was the younger missionary under whose leadership this pattern developed in the Suswa area. Ironically, this tighter control by the missionary seems to be associated with the so-called "Conservative" movement of recent years. It is ironic, and puzzling, that someone would call himself "conservative" while following a program of more control, rather than the traditional independent approach Baptists have championed and patterned over their centuries of modern existence. Baptists have been known for the autonomy of local congregations and the dynamic variety of forms and structures according to the cultural and social settings they live and work in. I cannot pronounce specifically on the younger missionaries that followed Herb and me among the Suswa Maasai, but I have observed among some missionaries coming from the United Stated in recent years a desire to see churches in their new country look more like the churches they know in the US. Established Baptist missiology in East Africa emphasizes the development of indigenous churches. 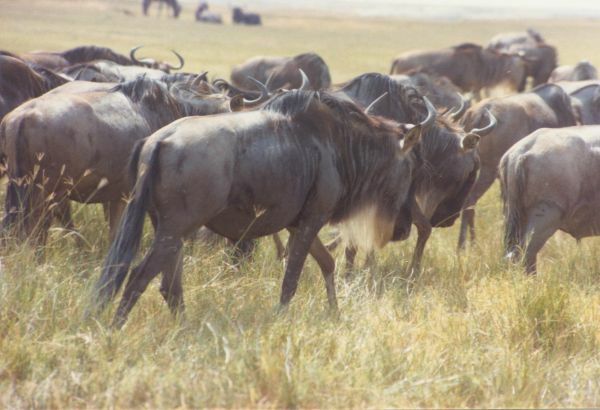 The wildebeest us a lumbering antelope that looks more like a slender American bison. The name is from Afrikaans, meaning wild animal. While this current young generation of missionaries are often eager and adventurous, it is strange that they sometimes feel uncomfortable with a church format or structure (or lack of it) that is too different from that in the US. Their avowed "conservatism" seems to focus more on abstract rational concepts of doctrine and on structural and institutional factors than on relational faith-life factors. They seem to have a more mental concept of faith, focusing on "doctrines," concerned with formal wording in externalized abstract statements of particular propositions they feel express the meaning of Christian faith. This assumes that the true meaning of Christian faith can be summed up in reductive basic statements in human languages. This seems to contradict Jesus' approach in drawing people beyond themselves to an experience of the presence of God, while always expressing an aspect of mystery in God. The Gospels portray Jesus as emphasizing the realty of the Kingdom of God as God's presence experienced in relational and practical terms. Mental assent or intellectual formulations seems missing from Jesus' description of the Kingdom of God. Many teachings tell us "The Kingdom is like...." But none of those includes an objective list of mental facts that Jesus taught or prescribed. Jesus seemed concerned about the alienation of sin. He addresses this estrangement of humans from God in many ways, with many vivid common illustrations. He never seems to describe salvation in terms of mental knowledge. A sad aspect of this mental neo-Gnostic focus on a fixed, received form of official expression of "doctrine" is a need to control verbal expressions of faith, especially in writing. This inevitably becomes a distraction and drain on the focus and energies of a new church movement to continue reaching out. Concerns begin to focus on consolidation and control, limiting variation of the formal expressions of faith. Meanwhile the cultural environment may be totally unlike that in which the western missionary's formal "doctrinal" expressions arose. The Westerner may think they are direct statements from scripture, but they are invariably rational, deductive generalizations, abstract representations which satisfy the rational cultural demands of thought in a scientistic mindset. The western worldview since the Enlightenment has favored Rationalist approaches that value fact and written word above life meaning and faith experience. It is hard for this type of individual, no matter how vibrant and strong their own personal faith, to relate to the dynamic event-world of Africa and most of the world. This dynamic oral-relational, or concrete-relational view of reality is keenly aware of experiences in the spirit realm, both good and evil. It is in this spiritual concept of the world that most of the world lives. In this context the direct biblical context was relevant and pertinent, focusing on the relationship of humans with their Creator and the resulting relationships between people in society. Just as Jesus portrays consistently in his teaching in the Gospels. Modern western tendencies tend to reduce everything to objective rational, factual descriptions. This "positivism" deeply affects every post-modern individual – even those with a keen Christian self-identity. Ironically, for the fundamentalists who prefer this approach, it is a legacy from Modernism, the modern Rational scientific era of objective fact. This worldview has a basic materialist cant, which discounts aspects of existence that are not susceptible to sense perception and physical verification. More sophisticated scientists do not take such a reductionist approach, but the more radical and the general popular views generally discount or oppose claims of unseen spiritual realities and religion in general. The Western church is rife with this assumed cultural perspective! This is a different worldview from the dynamic, relational worldview reflected in the Bible, similar to the majority of oral cultures even today in our world. These dynamic, oral cultures are focused on concrete, relational meanings of life. These relational values are the terms in which Jesus himself relates the meaning of the Kingdom of God – not a list of abstract doctrines, but personal life situations and relationships, both to the Divine and to others humans. I like Jesus' emphasis. The early work in the Suswa area was open in approach, open-ended as to format and structure, and oriented to discovery of meaning of the gospel in the Maasai context and of appropriate forms and structures to implement those. Answers to questions were not provided by the missionary, but they were encouraged to deliberate and study, coming to a consensus appropriate for their cultural setting. The primary "method" was spending time with them and talking about life, sharing our stories. Of course we also met to sing and read from the New Testament, and I would preach, initially in Swahili through Maasai Christian interpreters, while I was learning the Maasai language. in a condensation tank from the steam of Hell's Gate, supplemented with water we carried out in our pickup in barrels from Limuru to the Rift. I worked there only about three years, working part-time (though almost every weekend over three years). bringing on another part-time missionary. After about a year, my partner transferred from his school principal assignment to work with the Maasai fulltime, though I continued to be responsible for the work I had started. I then gradually turned the work over to him. We worked informally, fostering the Maasai to learn and develop their own faith and make their own decisions about needs like buildings and such, when they brought up the questions. I just encouraged them to talk and think about that, why they wanted it, what it would do, how they would pay for it, etc. So the focus from the beginning was on an indigenous faith community in each village and the broader fellowship. We had the first baptism about 6 months after beginning, and had 7 churches in different villages after about 10 months, and a new association was accepted into cooperation with the Baptist Convention of Kenya. As practical questions came up or they expressed "doctrinal" questions arising from their study of scripture, I tried to foster their discovery of appropriate answers by catalytically asking open-ended questions. I hoped this would lead them to think through what they were encountering, or what they were finding in the Bible. I did not focus on structures and systems, except we conducted leadership training sessions, mostly Bible study and discussion of practical questions that arose in the church and community. This was interactive, question-answer style, though centered around a biblical passage or topic I planned. But the agenda was flexible and practical, because this was about following Jesus, not about learning information. I wanted an indigenous expression of faith that arose from the new believers wrestling with matters as they arose, in the pattern I observed in Luke's story of key events in the spread of churches in the Greco-Roman world in the first century. While it is clear, especially from comparison with certain matters discussed in Paul's letters in the New Testament, Luke's story in what we call the Book of Acts is somewhat stylized. Still, the key feature we see there is variety, based on the local situation. The underlying pattern in the book of Acts is that the new believers in all these new situations were discovering what the faith meant to them in their cultural and social setting. They were discovering or developing implications and approaches or methods as each question, need or situation came up. The Maasai have a traditional concept of one Creator god whom they pray to. Their traditional prayers reflect a similar concept of God as the biblical God, but they lack a traditional concept of close relationships and interpersonal activity in daily life. First-century Christians we read about in the book of Acts and the New Testament letters had no background of faith, not even knowledge of Judaism for many of the Greek and Roman believers. Many had never believed in only One God before. Though the Maasai believed in One Creator God, they were in a similar exciting, fresh, open and eager situation of encountering the Creator God in a new personal way, and learning each day new implications of what that meant! The story of Jesus showed them new possibilities of a personal relationship with God. This followed the Maasai (and general African) pattern of communal discussion, oral sharing and deliberation and decision by consensus. This was the pattern I followed even in my early teaching and leadership training. We learned together as the implications of the Good News about God's Kingdom unfolded for them. The early work arose inductively, dynamically, very much around the simple format illustrated in the book of Acts. The key common factor in Bible study, discovery of critical points of teaching in the Maasai structure depended on the network of relationships and conditions among the groups of believers in the different villages. Oral-relational methods were critical. The method called "Storying" was only just then beginning to develop as a technical method. I had been telling stories, though, since I first went to Kenya in 1971, when I saw how the African peoples used stories. Narrative is critical. But that always has meaning in interpersonal relationships, not abstract as information. The Bible is narrative! Not a catalogue of abstracted facts or "truth" for intellectual acceptance and affirmation. But stories portraying Divine-Human relational dynamics! The Maasai responded well to the idea that God came to earth in a human life, Jesus. They expressed excitement that Jesus was a presentation of God in human life in a real human tribe, in a specific country of the world, at a certain time in history, a person with a tribal (human) identity like them! This made sense to them, and the Good News was personal and viable to them. Though some older generation folks had difficulty to understand exactly what was happening and how to understand Jesus, the Suswa Maasai really accepted the story of Jesus and found it easy to believe that he was the Son of God for them. The Suswa faith communities developed as the Good News arose among them as a natural awareness of a Relational Possibility. They saw in the story of Jesus the missing dimension they desired in relationship with the One True God they already believed in, but did not know in a personal way.